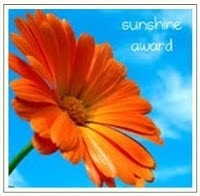 I was tagged by Rhiann Wynn-Nolet for the Sunshine Award. In return I’m going to tag anyone who wants to play. Just answer the questions on your blog and let me know when your comments are up, and I’ll check out your post. Or feel free to pick a question and answer it here. What is your Favorite Christmas/Festive movie? The old version of How the Grinch Stole Christmas. Personally, I think the Jim Carrey version is pretty much criminal. Depends on the time of year. But since this is the Sunshine Award my favorite sunny-bright flower is the calendula—and it gets bonus points for being beautiful, fragrant and eatable. 3. What is your Favorite Non-Alcoholic Beverage? This is another tough one. I actually don’t drink alcoholic beverages, so I have a lot of non-boozy favorites. On a hot summer day, I really like kicking back with an iced caramel latte. Learning new things: researching almost anything. 5. What is your Favorite Time of Year? Spring. I love watching the leaves return and hearing the spring birdsong. 6. What is your Favorite Time of Day? Early evening. Sunset signals it’s my time to do what I want. Then again, I love watching moonrise. 7. What is your Favorite Physical Activity? 8. What is your Favorite Vacation Spot? I love the seacoast of Maine. Hmmm . . . Maybe my favorite physical activity could be beachcombing. It’s all about discovery and change. I also love Maine’s Great North Woods—and the forest in Massachusetts’ Berkshire Mountains. Vermont’s Green Mountains would work as well. And I’m dying to go to Vermillion Bay in Ontario, Canada. Okay, let’s just say someplace quiet with animals, birds and good museums within driving distance.